Umreth:Dewang Mehta Foundation today announced the launch of a sustainable livelihood center at Umreth in Central Gujarat on the occasion of Late Shri. 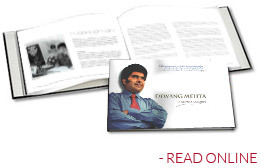 Dewang Mehta’s 56th birthday. Acording to Dewang Mehta Foundation, the center which is being implemented by Natarajan Education Society at Umreth is equipped with cutting edge digital technologies including video walls, Augmented and Virtual reality to benefit the students with the use of best in class training methods. The center is being supported by NASSCOM-the Software Industries Association, the Directorate of Employment and Training, Gujarat and Umreth Nagarpalika. One in every 7 households in Anand has a job seeker and centers such as these with the support of government will help these youth. The center will offer free of cost training to the underprivileged youth of Umreth and would have digital empowerment and building self-confidence and taking ownership for careers at its core. It will provide training with a holistic approach comprising of counselling and choice based options for skills training. Dr. Ganesh Natarajan, Managing Trustee of Dewang Mehta Foundation and Founder, Natarajan Education Society spoke about the charismatic personality of Dewang Mehta and how his positive attitude enabled India achieve key breakthroughs in the nascent phase of the IT Industry. He further stated “Dewang Mehta Kaushalya Kendra is the first of its kind to be set up in Gujarat which would be using path breaking approaches to train the youth for employment and livelihood opportunities in areas such as IT, Nursing, Catering, Fashion Design and several others along with digital empowerment. We also plan to develop partnerships with employers and other skills providers to provide a range of career options for the youth”. IT sector which has been growing at a CAGR of 48% in Gujarat in the last 10 years is an important employment sector that the center targets. It is estimated that 1.2 Lakh jobs every year are created in this sector. 2013 Dewang Mehta Foundation. All Rights Reserved.